Three $5,000 to Win GUARANTEED Races for Just $100. Multiple Entries Allowed . . . or Six $5,000 to Win GUARANTEED Races for Just $200! 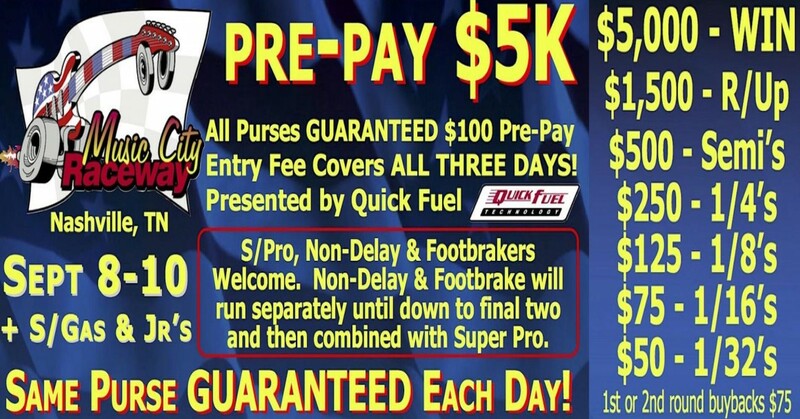 Deadline is week prior for Pre-Pay then $200 at the gate or $100 per day for each $5K PLUS Super Gas Saturday and Jr. Dragsters Saturday and Sunday! Three $5,000 to Win GUARANTEED Races for Just $100 covers all three days entry. Super Pro, Non-Delay & Footbrake welcome. Will run separately until down to final pair and then combine with Super Pro. $5,000 to Win, $1,500 Runner Up, $500 Semi's, $250 1/4's, $125 1/8's, $75 1/16's and $50 1/32's. $75 buyback. Save $100 if purchased TUESDAY MIDNIGHT PRIOR to event. Gate price at event $200. Weekend Tech Card Entries Non-Transferable. JR. DRAGSTERS 9/9 & 9/10 $500 Win GUARANTEED, $200 R/Up, & $50 Semi's with $50 Entry Fee for BOTH DAYS. SUPER GAS on 9/9 with $60 Entry Fee $1,000 to Win with 22 cars or more, $300 R/up & $60 Semis.